We've translated Mexican hot chocolate into soft and chewy cookies, perfect for holiday parties and midnight snacking. Just add a glass of milk, and you're ready to go. Turn the oven to 350° F.
Using an electric mixer, whisk together the sugars, butter, cinnamon, cocoa powder, cayenne pepper and sea salt in a bowl. Add the two eggs and vanilla extract to the first bowl. Mix until it's light and foamy. Set aside. In another bowl, thoroughly combine the baking soda and flour. Beat the sugar, butter, cinnamon, cocoa powder, cayenne pepper, salt, eggs and vanilla extract together in the electric mixer on low speed. Slowly add the flour mixture. Once the dough is thick, cut up the chocolate bar and melt in a microwave-safe cup for one minute. Let it cool down for another minute. Pour into the electric mixer and mix on low speed. Place tbsp-sized dollops of the dough onto two baking sheets. 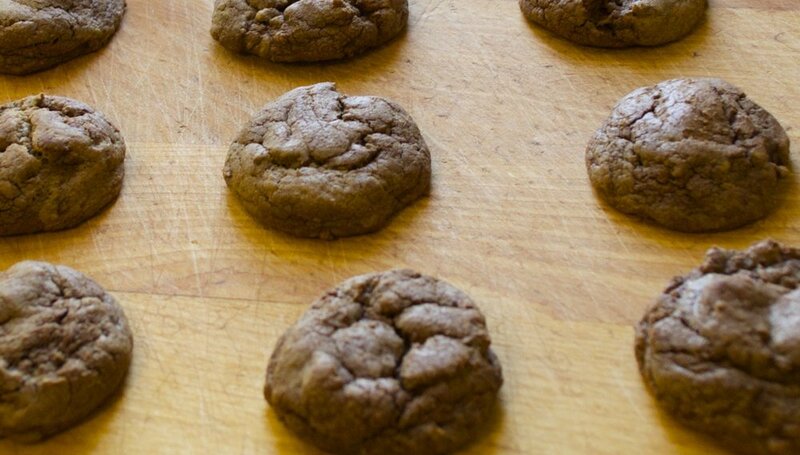 Bake for 10-13 minutes for chewy cookies. Enjoy!